Fixture: What you need to know Join Collingwood Media Manager Sarah Allen as we explain the key points behind Collingwood's 2017 fixture. Lachlan Keeffe has played 40 senior games since making his debut in 2011. 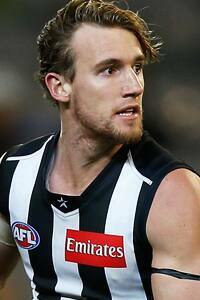 Collingwood has formally elevated tall utility Lachlan Keeffe onto its senior list. Keeffe and fellow Queenslander Josh Smith were the two rookies moved onto the senior list. Josh Thomas and Mason Cox have been retained on the club's rookie list. Keeffe and Thomas accepted two year bans after testing positive to banned substance clenbuterol in March 2015. The pair can resume training with the club in December. In: Lynden Dunn (traded from Melbourne), Will Hoskin-Elliott (traded from GWS Giants), Lachlan Keeffe (upgraded from rookie list), Chris Mayne (Unrestricted Free Agent from Fremantle), Josh Smith (upgraded from rookie list), Daniel Wells (Unrestricted Free Agent from North Melbourne). Out: Nathan Brown (Restricted Free Agent, to St Kilda), Travis Cloke (traded to Western Bulldogs), Jack Frost (traded to Brisbane Lions), Corey Gault (retired), Tim Golds (delisted), Matthew Goodyear (delisted), Brent Macaffer (retired), Dane Swan (retired), Alan Toovey (retired), Marley Williams (traded to North Melbourne), Jarrod Witts (traded to Gold Coast), Darrean Wyatt (delisted). Retained Rookies: Josh Thomas, Mason Cox.